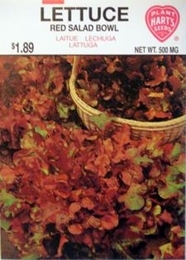 Maroon-red oakleaf type is sweet flavored and tender. Make a colorful addition to salads. Plants make large rosettes which are slow to bolt allowing harvest over a long time. As heads develop pick outer leaves off every other plant, then remove completely to allow the rest of the plants more space. Repeat plantings every 2 - 3 weeks for continuous harvest all season.